Emperor beds are fantastic, statement beds. They can come in traditional or modern designs but can be hard to source bedding for. As an Emperor bedding experts we know one of the main problems can be in finding the right size pillow to fit your Emperor bed. 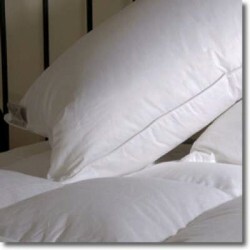 Standard size pillows (29" x 19") can look a bit lost although having three across the bed can look quite impressive. 3ft and even 3ft 6in pillows are more popular and do give the bed a more balanced look. Victoria Linen stock UK made 3ft and 3ft 6in Pillows in a number of high quality fillings including fibre, Duck Down and superior Goose Down. If you require more information or are looking for a larger pillow please call 01706 220020 for help. Larger Pillow in Duck Feather & Down Natural 85% Soft Duck Feather, 15% Down Pillow, size 9..